The Algiers Marseille ferry route connects Algeria with France and is currently operated by 2 ferry companies. 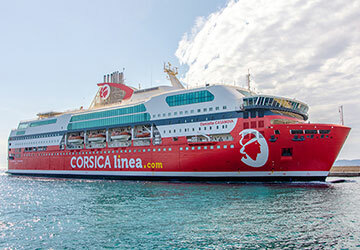 The Corsica Linea service runs up to 3 times per week with a sailing duration of around 23 hours while the Algerie Ferries service runs up to 2 times per week with a duration from 21 hr. So that’s a combined 5 sailings on offer per week on the Algiers Marseille route between Algeria and France. Compare now and get the best fare at the time that you want to travel. Prices shown represent the average one way price paid by our customers. The most common booking on the Algiers Marseille route is a car and 1 passenger. Algiers is the capital city of Algeria and is situated on the Mediterranean coast. Found in the north-central area of the country, Algeria’s largest city sits on the west side of a Mediterranean bay. The North African country has a variety of beautiful landscapes, from stunning beaches with picturesque coastal towns, to the spectacular Sahara Desert, which makes up 85% of the country. The French-African city boasts a large number of museums thanks to the rich history and diverse culture of the area and also has the nickname of ‘Alger la Blanch’ (Algiers the White) due to the stunning setting of gleaming white buildings rising from the sea. The local architecture is a standout feature with the Kasbah quarter containing a mix of squares, mosques and cathedrals from the Islamic and Roman Catholic influences which have gripped the city over different periods. The Port of Algiers stretches ten miles across the Bay of Algiers and is arguably the most important seaport in North Africa. The port area itself has a number of attractions to keep you occupied while you wait for the ferry. There's a fascinating 17th Century Kasbah by the terminal, which was listed as a UNESCO World Heritage Site in 1992. The terminal is easily accessible from transport links with Algiers Train Station just a short walk away and the N11, Rue d’Angkor linking the port to major road networks. The port runs ferries to Marseille in the south of France and Alicante in Spain, with a handful of long distance services a week.